Conor Grennan is the most self-effacing author you will ever read. starter with girls at the bar. He gets more than he bargained for. the boys and girls of the Little Princes Orphanage in Godawari, Nepal. functions and how to get inside that government to make a real change. exemplary story for every walk of life. 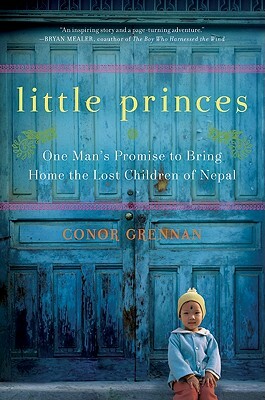 After volunteering at the Little Princes Children’s Home in the village of Godawari in 2004, Conor Grennan eventually returned to Nepal to launch Next Generation Nepal (NGN), a nonprofit organization dedicated to reconnecting trafficked children with their families. He resides in Connecticut with his wife and two children. In the tradition of “Three Cups of Tea” and “Mountains Beyond Mountains,” this book provides proof (there cannot be too much) of the value of volunteer work.